All Christians know they should pray, but sometimes it's hard to know how-especially if the minutes start to drag and our minds start to wander. 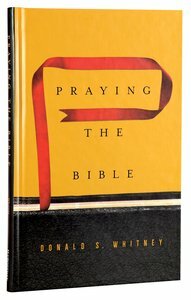 Offering readers hope, encouragement, and the practical advice they're looking for, this concise book by professor Donald Whitney outlines a simple, time-tested method that can help transform our prayer lives: praying the words of the Bible. Praying the Bible shows readers how to pray through portions of Scripture one line at a time, helping us stay focused by allowing God's Word itself to direct our thoughts and words. Simple yet profound, this resource will prove invaluable to all Christians as they seek to commune with their heavenly Father in prayer each and every day. Customer Reviews For "Praying the Bible"